Every two minutes in the UK, someone disappears; that’s over 200,000 people a year. Crime fiction – whether books, TV or film – would have us believe that most of these people would be done away with by serial killers, but as Claire McGowan points out in her new novel The Lost, statistically 64% will have gone missing voluntarily, 19% will just drift away from weak societal bonds and 16% will not mean to go missing, but will somehow lose their way or their memory. Only 1% of missing people vanish as a result of someone else taking or hurting them. It is this 1% that haunts psychologist Paula Maguire. As an expert on the missing, Paula is seconded from her usual work in London to a newly established Missing Persons Unit based in the small border town of Ballyterrin in Northern Ireland, which also happens to be the hometown that she happily left as a teenager. The Unit is based in this seemingly out of the way place for a reason. Not only are there plenty of unsolved cases of missing persons across Ireland, but the proximity of the border has made many historical ones hard to properly investigate; two police forces, two countries and the legacy of “the Troubles” make for a lot of missing people never being found. Despite the Troubles being consigned to the past and the establishment of a new, less politically charged, police force in Northern Ireland, the events of these years hang heavily over the town and the plot. To say that The Lost has an atmospheric sense of place is something of an understatement. The Missing Persons Unit is already busy when Paula arrives, as the disappearance of two local teenage girls – one the daughter of a local businessman and the other from the traveller community – provides the first real test of the new squad’s effectiveness. Are either of these girls in the worrying 1% or is there another explanation to be found? Clues seem to link to cold cases from the 1980s as well as to a new evangelical church youth group that has recently opened in town and it isn’t long before Paula finds herself being forced to accept help from her old flame Aidan, now the editor of the local newspaper and Ballyterrin’s finest (only) investigative journalist. Investigating two missing girls is difficult; carrying out that investigation in a claustrophobically small town where too many people can remember your troubled past is altogether harder. 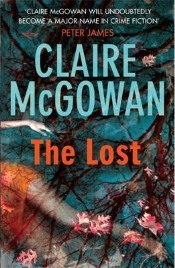 The Lost is only McGowan’s second novel (the first being a standalone published last year), but it comes across as a mature and well-plotted piece of writing. The originality of the setting and the context – missing persons rather than serial killer as with so many thrillers – made for a memorable read, and while I could see part of the ending coming a mile off, there were plenty enough twists and turns to keep me wanting to read right to the end. In fact, the part of the ending I guessed seemed to work as an effective cover for other plot developments, making for a satisfying finish to the novel. I really enjoyed reading it, and I look forward to Paula Maguire’s inevitable second outing. No Comments on "The Lost"